Have you ever thought about all of the trash that can be generated at a food truck rodeo? Fifty or more food trucks and thousands of hungry eaters all in one place can make A LOT of garbage! When we started putting together the food truck rodeos back in 2010, we were overwhelmed by all of the waste that was generated and tried some different strategies to manage it – More trashcans! Bigger dumpster! Adding recycling bins! But, in 2015, everything changed. We started working with Keep Durham Beautiful to turn our high waste generating event into a Waste-Wise one. Keep Durham Beautiful (KDB) had received a grant to work with large scale events in Durham to reduce waste. Quickly, they identified our Food Truck Rodeos as an event that was in need of a change. KDB helped to create waste stations where food truck rodeo guests can divide their waste into compost, recycling and landfill trash. They supplied signs to help guide people when dividing their trash into the proper bin. Once the the bins were in order, KDB helped us to work with the trucks to increase the amount of waste generating material that can be composted. With their support, we were able to ban the use of styrofoam at the rodeos and encourage trucks to start using compostable and recyclable service items. With these changes, the amount of trash going to the landfill was drastically reduced. It was exactly the help that we needed! Most importantly, though, KDB started the Waste Warrior Volunteer Program. The Waste Warriors are a team of volunteers that help staff all of the waste stations during the rodeos. They help guests sort their trash and educate folks about what can be composted and recycled. Often, toward the end of the Rodeo, the Waste Warriors take trash off the trucks and sort it before it goes to the dumpster. The Waste Warriors have contributed hundreds of hours and have been instrumental in making the rodeos waste wise events. Now that the program is set up and running and Styrofoam has been eliminated, we found that most of the waste generated at the rodeo can be composted. Very little trash heads to landfill, it’s mostly just straws and plastic utensils! Since we started making the rodeos low waste events, we average about 1000 lbs of compostables and 800 lbs of recyclables are diverted from the landfill at each rodeo. There have been times when, at the end of the rodeo, the rented dumpster is practically empty! The support from rodeo guests and food truck owners has been fantastic and really kept our momentum going. Rodeo visitors are used to dividing up their waste and are pretty excited to learn that most of what they throw away during the rodeos is composted. The trucks are happy to support the program and some have made changes in their general practices to make their trucks more waste-conscious every day. 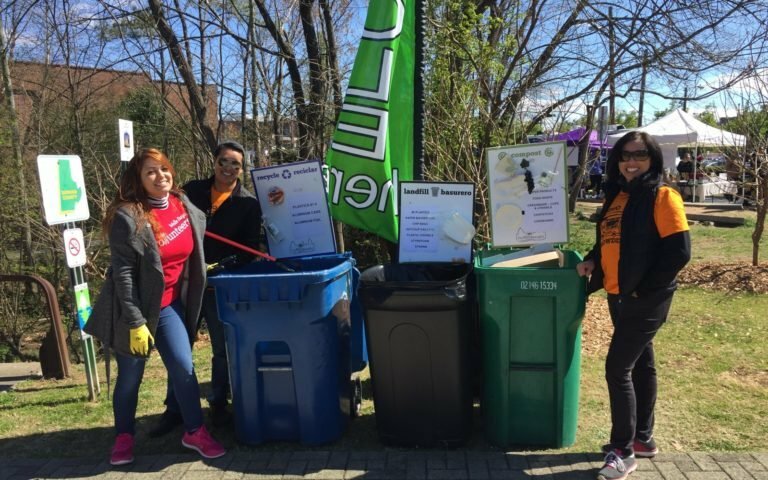 Become a Waste Warrior Volunteer! We are always looking for more Waste Warrior Volunteers. If you are interested in helping out or you have a service group that would like to join, we love to have you! You can read more about what Waste Warriors do and email [email protected] to sign up for a shift. The 12th annual Meals from the Market fundraiser plans are coming together! We are looking for a few more folks to host meals. Would you join us? What is Meals from the Market? MFTM is DCP, Inc’s biggest fundraiser event! It is a series of meals from September to November where DCP enthusiasts host a meal at their home, restaurant or other venue. The meals have different themes and numbers of attendees. All the meals are donated by the hosts and the proceeds from ticket sales go straight to support DCP, Inc.
You set the date, time, location, number of guests and suggest a price for a ticket to your meal. Each Meal brings in anywhere from $600 to $6000 in total. It can be a breakfast, brunch or supper on any day of the week in September or October. You come up with a “hook” to attract ticket sales. This could be a unique menu, location, entertainment or theme. We’ll help you come up with a catchy title. You build interest in the meal among your friends and contact (you get to invite them for ticket pre-sales!). But, you should be prepared to host guests you have never met before. You donate all the expenses involved. So, it helps to get co-hosts. In the end, DCP can prepare a tax letter for your in-kind donation. All ticket sales go directly to DCP. Host the meal and have fun! Don’t think your meal has to be extravagant. Keep it to a size that will be manageable and fun for you to produce. DCP maintains the guest list and will send hosts updates as sales progress. You will be notified when your meal sells out and tickets are no longer available. DCP will provide materials and designate a person to give a shout out to the work of DCP, Inc, during the meal. Meals from the Market is a great opportunity to share your enthusiasm for the park and help support the work that we do to provide this important space for the community. 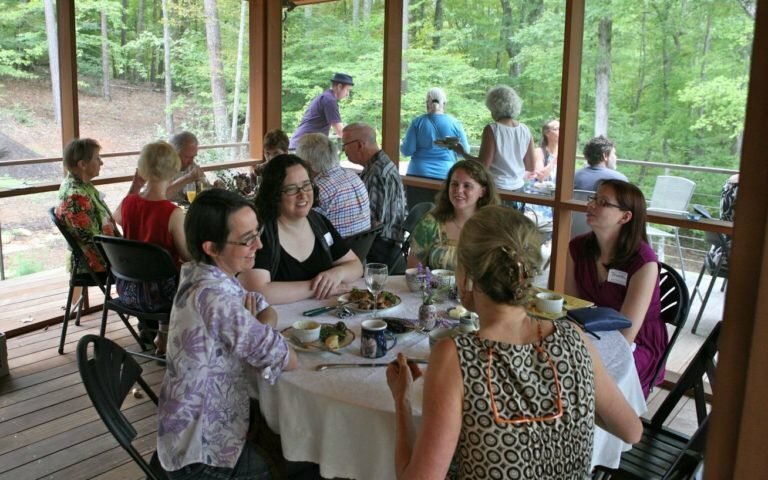 If you can’t host a meal right now, we hope that you will be able to join the fun at a meal this fall! 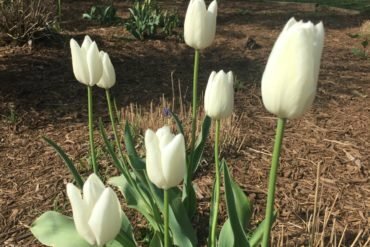 On April 20th, Durham Central Park received two Golden Leaf Awards from the Durham City-County Appearance Commission, Keep Durham Beautiful and the Durham City-County Environmental Affairs Board! The Grace Garden was the first garden installed in Durham Central Park. 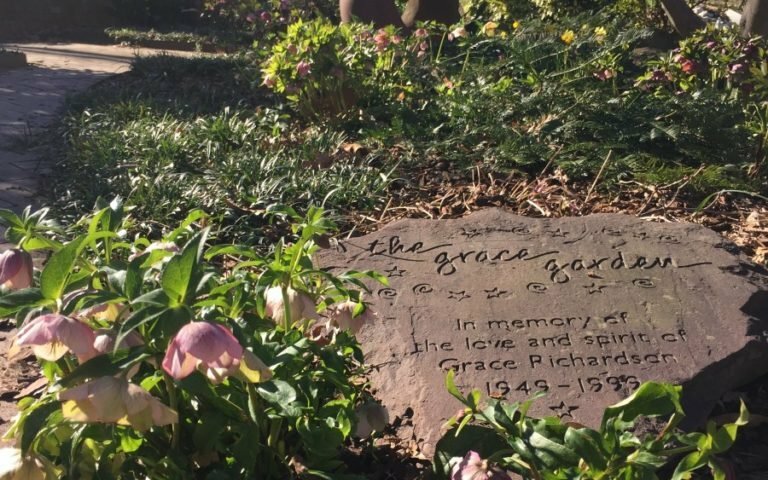 The garden is dedicated to the memory of Grace Richardson, who died in a tragic drunk-driving accident. After she died, her friends, family and many people that she touched in the community raised the money to create a garden in her memory. It was constructed in the spring of 2001 by dozens of volunteers in a great community building event with Masonry done by TROSA. The Grace Garden is one of several gardens on the west side of Durham Central Park. It offers a secluded and shady but of Zen-like quiet beauty in the middle of the city. The garden features local art by Andrew Preiss, bench seating, and a menagerie of beautiful plant-life. Mount Merrill wins the Keep Durham Beautiful Award! Advance efforts to reduce waste through reducing, re-using or recycling. Mt. Merrill, as many know, is our interactive children’s play area on the east side of the park. 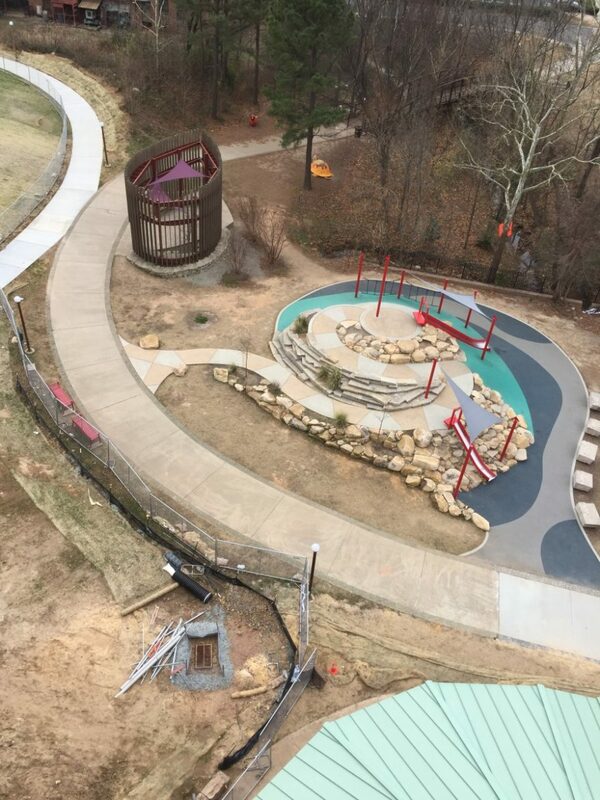 It is a handicap accessible mound that offers 2 slides, a climbing net, a boulder climbing area, and a lookout on top. It was designed by the DCP design committee and Tributary Land Design and then built in 2014 by CT Wilson. Mt. Merrill officially opened in December of that year and has been a nexus of activity in the park since then! Mt. Merrill is named in the memory of Merrill Davis of Stone Brothers and Byrd. Merrill tragically died in a car accident in 2012. During his life, he was a huge supporter of the Park. He was volunteered his time, expertise, and resources to build the park into what it is today. He and his wife were some of the first people to be married in the park after the Pavilion was built. 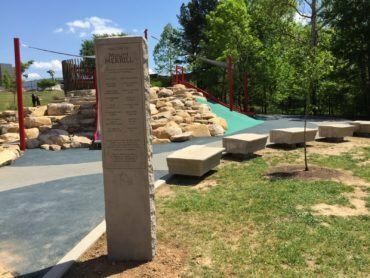 After Merrill’s death, his friends and family approached DCP about putting a memorial for Merrill at the park. At that time, DCP was starting to work on the plans for a play area for children and it worked out that we were able to work collaboratively to create this fantastic play mound in Merrill’s memory. One of the reasons that the judges chose Mt. Merrill for the Keep Durham Beautiful Award because of the incredible amount of community support at all stages of this project. It was designed with the input of the community, particularly parents looking for an exciting place to let their children play. The funding for the project came from all over the Durham community. In addition to a successful Kickstarter campaign, backed by hundreds, we had major support from local businesses and individuals to make Mount Merrill happen. The key supporters for the project were East West Partners, PNC Bank and The Durham Lions Club (where Merrill was an active member). The other major donors are listed on the monument at the entrance. Since Mt. Merrill opened, Stone Brothers and Byrd has taken on the (sometimes thankless) duties of keeping the trees and grass growing around Mt. Merrill. In early 2016, local artist, Al Frega, installed benches that were made from reclaimed limestone cornice stones from the Southern Railway Freight Depot and Durham Marble Works installed the entrance sign. Currently, we are working with Acme Plumbing on the plans to install a water fountain. We are hoping to have that installed by early summer. 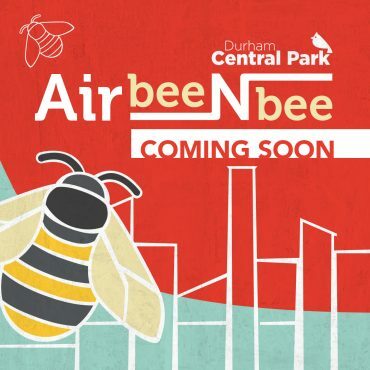 Coming Soon to Durham Central Park… Air Bee-n-Bee! Air Bee-n-Bee is a bee hotel, which is a sustainable nesting place for solitary bees. Solitary bees, like honey bees, are important pollinators. Healthy pollinator populations are an important part of all ecosystems – agricultural, urban, and natural. Air Bee-n-Bee will be installed on the east side of the Park in late spring. Once Air Bee-n-Bee bee hotel is installed, DCP will hold a grand opening celebration. Stay tuned! Air Bee-n-Bee (pictured on the right) was made as a collaboration between Durham-based, Burt’s Bees and Bee Downtown, a local company that is focused the goal of building healthy and sustainable bee/pollinator communities. It was constructed by Burt’s Bees employees and designed by Gabe Eng-Goetz, the owner of Durham based Runaway Clothing Company. The structure includes the skyline of downtown Durham and lots of space for bees to live and nest in the park. What is a Bee Hotel? A Bee Hotel is a sustainable nesting place that provides shelter for solitary bees to rest and lay their eggs. 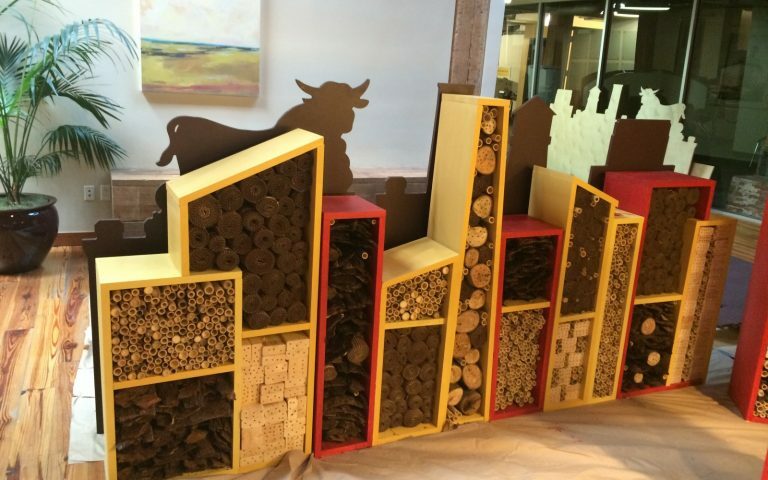 Bee Hotels come in many shapes and sizes and can be made from materials such as sections of old logs, untreated wood, or bamboo. Depending on the types of materials that are used, generally the entrances for the bees will range from 2-8cm and are spaced a few centimeters apart. These holes can be quite lengthy in order to prevent predators from reaching the bees. A warm, sheltered location is ideal for a bee hotel, for example a south facing area. Solitary Bees. There are over 2000 species of solitary bees that live in the United States. In fact, most bees are solitary. These particular bees live their entire lives on their own and are responsible for all the foraging, nest building and egg laying. They are our natural, indigenous pollinators. As the name indicates, they live solitary lives, not in hives as the honeybee. No. Because they don’t live in community, they also don’t defend their home as social bees do and are, therefore, very docile and non-aggressive to humans. 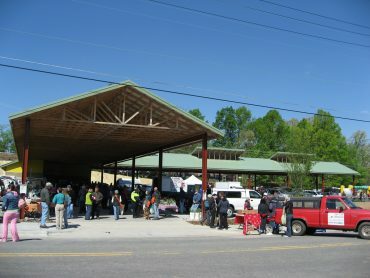 The Durham Farmers’ Market (DFM) started in 1999, with a handful of farmers setting up in the gravel parking lot of the Old Durham Ballpark. 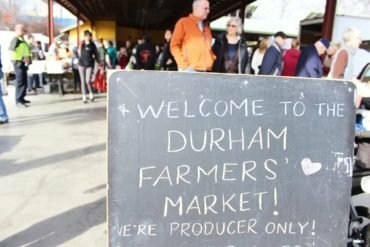 The farmers and vendors, all of whom were (and still are) located within 70 miles of Durham, gathered every Saturday during the main growing season – April to November. In their first few years, they had to move around whenever there was a Saturday event at the Ballpark. But, even so, they quickly became a Saturday morning institution. This location obviously wasn’t ideal. As they grew and became more established, they moved up the street to Measurement Incorporated’s parking lot on Morris Street (where their old sign still resides). 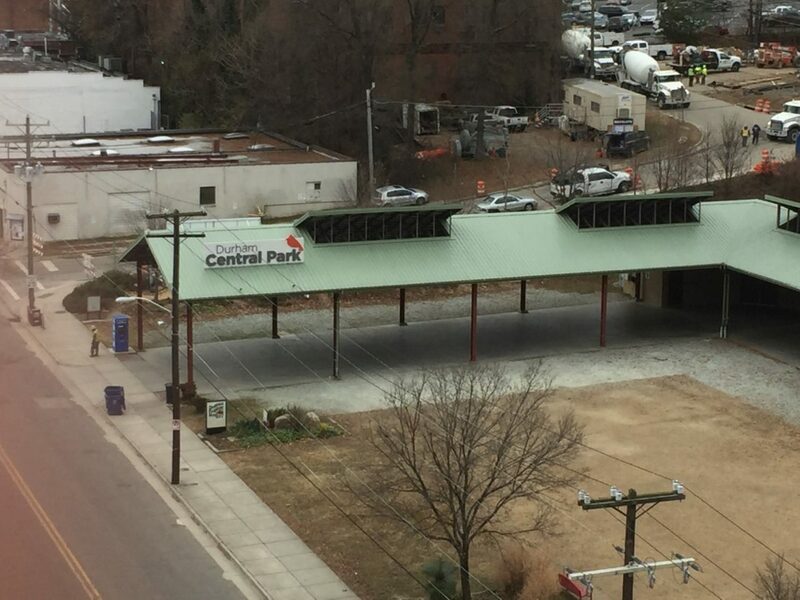 Around the same time that they moved to their new parking lot, DFM started discussions with Durham Central Park about the possibility of building a permanent structure in the Park for the Market to call home. In classic DCP form, public input meetings and charrettes were held to gather feedback, insights and ideas from the community about building a home for the Market. Interest and support quickly coalesced around this idea. With the city and the community on board, the designs were made and the task of fundraising began. 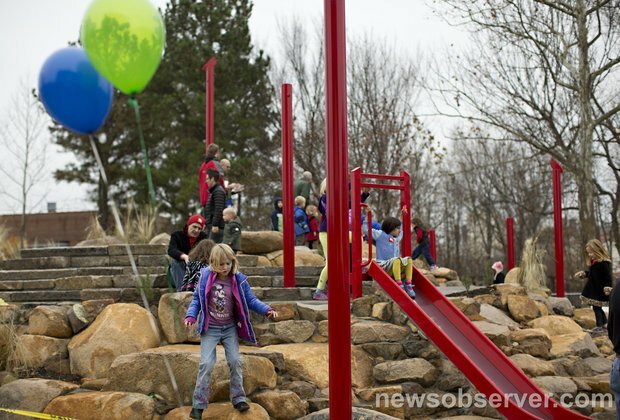 The City of Durham helped to secure almost $100,000 from a HUD Economic Development Grant and $49,000 from the Durham Open Spaces and Trails Commission. The rest of the money came directly from community members, local business sponsors, fundraising campaigns through the DCP and SEEDS Boards, and an incredible amount of guidance and support from Self-Help Credit Union. In 2006, the structure started going up! Then, on a very cold Saturday morning in April 2007, the Durham Farmers’ Market moved to their new home in Durham Central Park. Farmers drove in from the country with snow on their trucks. But, despite the unexpected cold snap, the mood was festive. There was a dedication ceremony with the city and county councils and everyone was excited for a new era of fresh, local food and community vitality in the Park! The move into the the park was a big turning point for DFM. In 2007, the word of the year was “locavore” and the interest in eating local food grew around both the region and country. Having an established home, and no longer having the air of transience, became the key to the market’s success. Since they moved into the park, it has grown significantly. They have added more than 25 new vendors, expanded to a year round market, added Wednesday hours in 2008, and have made food access a priority through their SNAP and Double Bucks Programs. 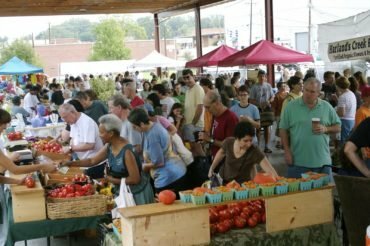 Every year, restaurants focusing on local and seasonal menus have popped up through Durham and chefs shopping at the Market are now a mainstay, with full bags and tubs of fresh, local food for their menus. The market’s move to the park wasn’t just a turning point for the farmers, but also the Park. Durham Central Park was still in it’s early stages in 2007. 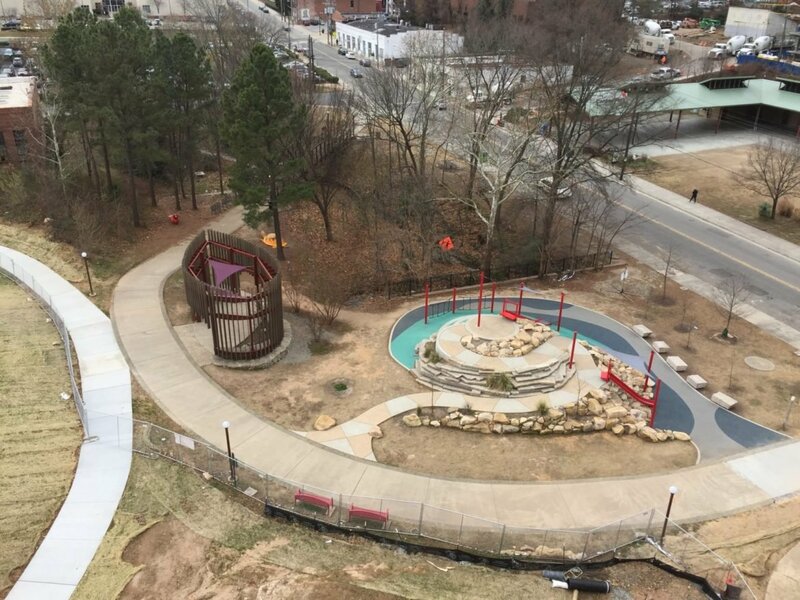 The gardens were just being established and having DFM move in as the anchor tenant, gave the community a good reason to visit the Park every week and grow to love it. The turtle and cardinal moved in shortly after the farmers, the skatepark was built in 2010, our Food Truck Rodeos became an institution, Mt. 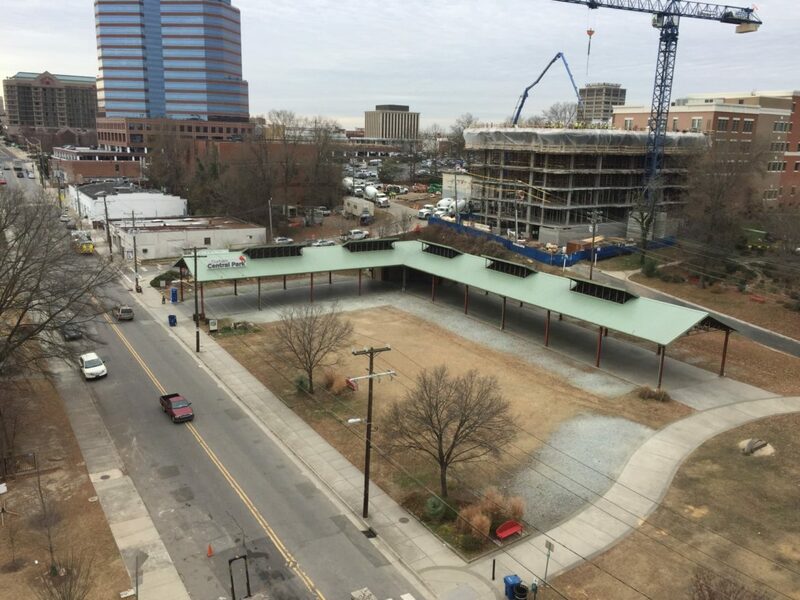 Merrill opened in 2014, and downtown Durham has, for lack of a better word, boomed. Since 2007, people have found hundreds of creative ways to use the space for weddings, fundraisers, dinners, concerts, exercise classes, rallies, and parties of all sorts. 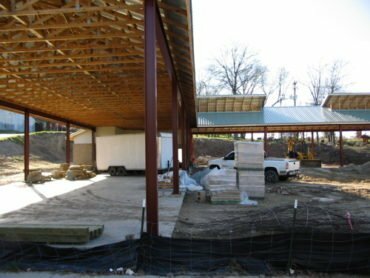 It has become the community gathering space that downtown had needed. 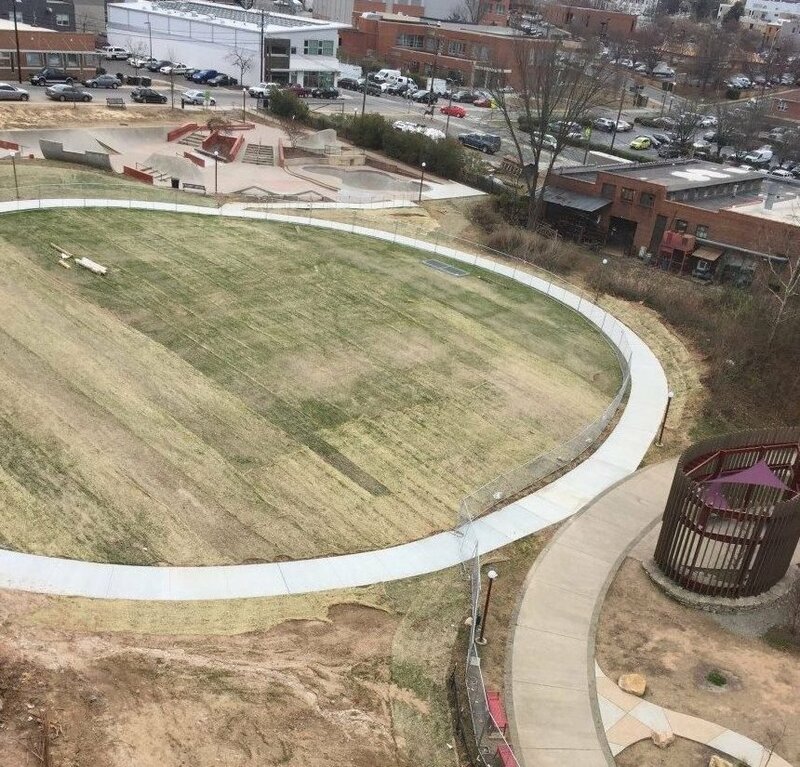 We, on the staff and the board of Durham Central Park, are constantly humbled by the way that the community has built the Park into what it has become today. The Park’s success really has been a direct result of the fact that the Durham Farmers’ Market has found its home in Durham Central Park. Here’s to many more years of working together! 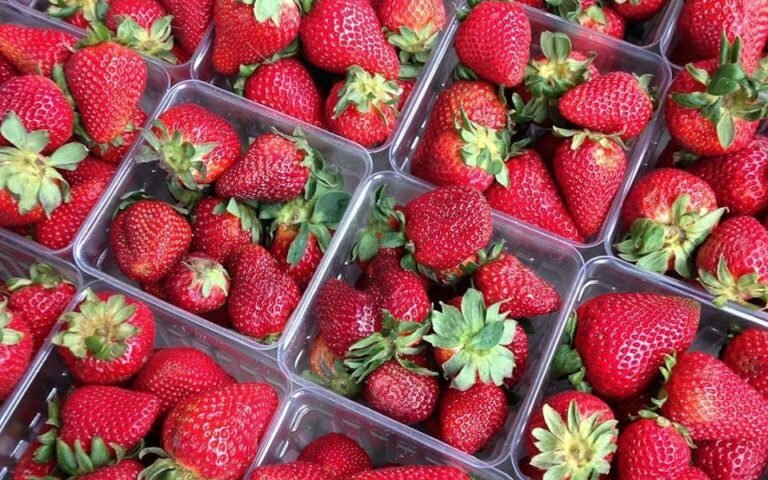 Wednesday, April 5 – Kick off of the Wednesday Market! Buy one, get one on bee tote bags and we will have fabric painting supplies available for decorating the bags. 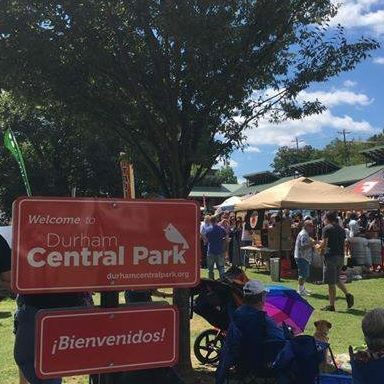 Durham Central Park was recently featured in an article in North Carolina Homes, Durham Central Park: Revitalizing Downtown Durham. They’ve also got Durham home listings, if you’re still working on your brother/mother/best friend to pack up the van, move down and enjoy all Durham Central Park has to offer! Last week, on a cold and dreary day, our Executive Director had the opportunity to take a tour of the new Liberty Warehouse Apartments. During the tour, she got to go up to one of the penthouse apartments and was wowed by the great views of the park. Even on that dreary day, the park emanates is subtle beauty and charm. Erin has worked in the park for over a decade (before working for DCP, she managed the Durham Farmers’ Market) but has never had the chance to see the park from this angle. Needless to say, she took lots of pictures and got a few great shots… Enjoy! Mt. Merrill and the Leaf plus the cardinal and turtle! 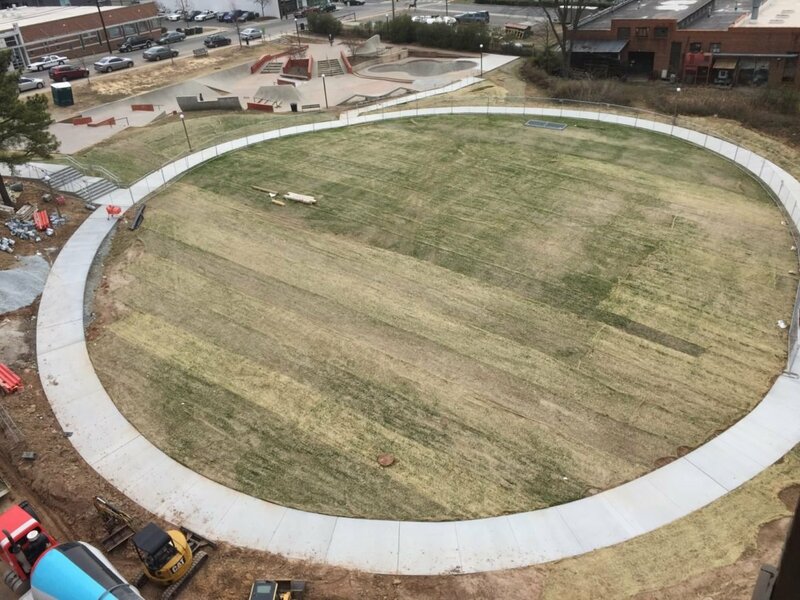 The new sidewalk around the great lawn and the skate park! The Pavilion. Just imagine this would look like during a food truck rodeo, or a concert or the farmers’ market! The Pavilion and our neighboring crane. KDB, Food FWD and Don’t Waste Durham work on waste reduction in many ways. 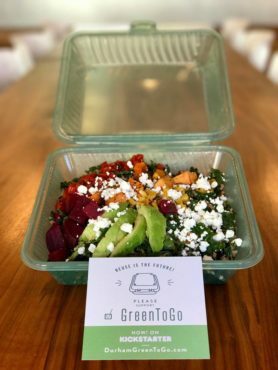 But, right now, Don’t Waste Durham is working to revolutionize how Durham does take out by introducing a reusable take-out container called the GreenToGo Box! DWD is in the final stretch of a Kickstarter campaign to get the project off the ground. Please consider supporting our partners in continuing to reduce waste in our lovely city! GreenToGo is a community-owned trash solution that lets people check in and check out boxes which are washed and sanitized in commercial dishwashers. This program is already succeeding in Portland and San Francisco – we want Durham to be the first city on the East Coast! But this campaign is much bigger than just to-go boxes in Durham, NC. DWD is developing an effective reuse model for our community and for the OTHER communities where they can bring the program next – Raleigh, DC, NYC, London, Tokyo, Rio de Janeiro! DWD is on the front lines of planting the seeds of change in people’s hearts and minds to think reuse instead of single-use disposables. Reuse is the future! So if you support the idea of reuse – even in PRINCIPLE alone – please back Durham GreenToGo! 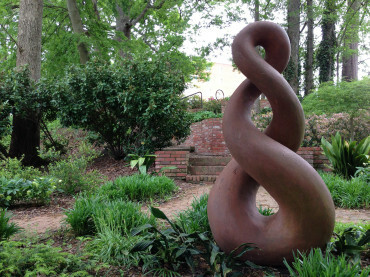 Durham Central Park and Liberty Arts Sculpture Studio & Foundry will have a public iron pour at Durham Central Park, Friday, November 18 from 5-9 p.m. After sunset, 1,500 pounds of molten, 2,500 degree iron will be poured into molds, in an exciting fiery display, including Liberty Arts artists’ work for sale, live buskers (street musicians), local food trucks Captain Cookie and The Milk Man – NC, Route Bistro LLC and Fullsteam Brewery beer. 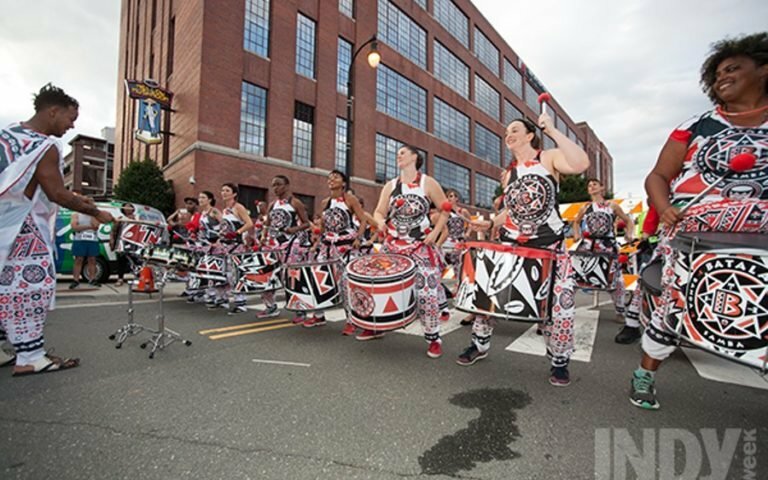 Durham resident fire spinners start at 7 p.m. November 18 is also Third Friday Durham, Durham’s monthly gallery crawl and studio tour evening. • Saturday November 12, 10 a.m.-12 p.m.
• Thursday November 17, 5:30-8:30 p.m.
• Friday, November 18, 2:30-7 p.m. Admission to the iron pour is free. Blankets and folding chairs welcome. 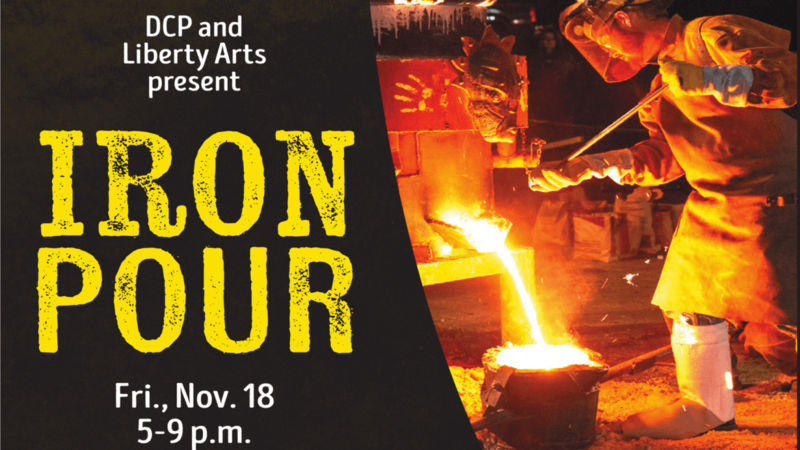 Fullsteam Brewery will serve from 5-9 p.m. and weather permitting, Third Friday Durham buskers (street musicians) will perform from 6-8 p.m.
Not sure what to expect at an Iron Pour? Check out this video of a pour that Liberty Arts did a few years ago.